What is a holstar? I think the question you really want to ask is … what isn’t it? It’s your Sidekick, Wingman, Knight in Shining Armor, or maybe just your next Necessary Accessory! 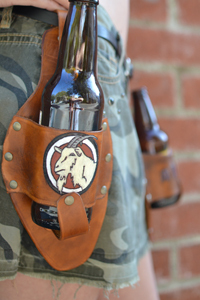 It’s the extra hand that you’ve always needed but never had, until now… a stylish beverage holder (aka beer holster) that allows you to keep your hands free. Now you can give a high ten (a high five with both hands), “good game”, or hug, throw a ball, join the tailgating games, and much more… all with your beer by your side. Get back in the game with your holstar! Is there more beer on the other side of the party? Save yourself the extra trip and put a spare in your holstar… it can also help improve your chances of making a new friend when you just “happen” to have an extra beer on hand. Tailgating? At a festival? Nature calling? We all know Port-o-Potties are nasty! Thankfully I can put my beer in my holstar! Use the holstar on campus at your fraternity parties, tailgating your favorite sporting event, picnics, family reunions, house parties, barbeques, bachelor/bachelorette parties or just walking around the streets of Vegas (cause it’s legal there)… not only do you want the holstar, you need it! It also makes a great gift (hint, hint groomsmen). 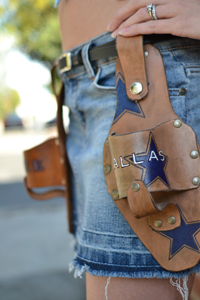 All holstars made by hand, customized any way you desire. Order your customized holstar now!